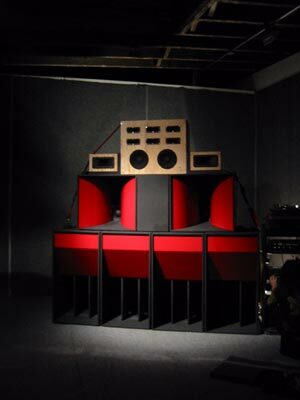 "Soundsystem" by Mark Leckey (New York: Gavin Brown's enterprise, 2002). But when I first got to New York, I had started Dj-ing in the same spirit as I’d done the [Dr. Seuss’s] Eclectic Jungle show in college [at Bowdoin]. My style was an experiment with rhythm and clues, rhythm and cues: Drop the needle on the record and see what happens when this sound is applied to this context, or when that sound crashes into that recording. The first impulses I had about Dj culture were taken from that basic idea – play and irreverence toward the found objects that we use as consumers and a sense that something new was right in front of our oh-so-jaded eyes. I wanted to breathe a little life into the passive relationship we have with the objects around us and to bring a sense of permanent uncertainty about the role of art in our lives. For me, as an artist, writer, and musician, it seemed that turntables were somehow imbued with the art of being memory permutation machines. They changed how I remembered sounds and always made me think of a different experience with each listening. ILLbient started out as a critique of conservatisms in the NYC music scene. Everyone from the artists to the promoters to the critics were all about “orthodoxy.” But keeping the boundaries between music styles in a world of total flux seemed crazy to me, and I wanted to figure out a way to flip things so that people could check the vibe. With a woman named Karen Levitt, I started a series of events based on indeterminancy, that were meant to pay homage to the Happenings tradition of the 1960s scene around John Cage, Nam Jun Paik, Joseph Beuys, and Allan Kaprow. Needless to say, many in the audience for ILLbient events didn’t know the history, but the deep background wasn’t necessary. In any case, the nineties were different from the sixties, the notion of an avant garde was becoming obsolete. People simply wanted to get paid, figure out different ways to create a forum for their zone to flow, and then leave it at that. As hip-hop turned inside out, ILLbient flew in the face of this kind of social logic, but without resorting to tired vanguard poses. 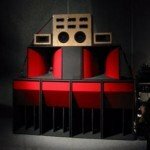 ILLbient was about preventing the outside world from crushing you with media bombardment, creating more active approaches to using the sonic and image archives in which we are immersed. Remixing my own Dj-ing with more aesthetic-historical references opened up my performing and recording to new zones, including museums and galleries, and allowed me to create Dj Spooky that Subliminal Kid as a conceptual art project. Although this persona was embraced by the art world and the critical establishment, I’m not really concerned with the academy per se. Frankly, by the start of the twenty-first century, the academy is such a reflection of class structure and hierarchy that it tends to cloud any real progressive contexts of criticism and discourse. By Dj-ing, making art, and writing simultaneously, I tried to bypass the notion of the critic as an authority who controls narrative, and to create a new role that’s resonant with web culture: to function as a content provider, producer, and critic all at the same time. It is role consolidation as digital performance. — Paul D. Miller in his essay “Districts” in Rhythm Science, (Cambridge, Massachusetts: Mediawork/The MIT Press, 2004), p. 45. Posted on behalf of Paul D. Miller on Wednesday, April 7th, 2010 under Quotations. więc jak to było z tym illbientem? kto wymyślił ten gatunek DJ Spooky czy DJ Olive? według strony discogs.com DJ Olive praktycznie wcale nie robi muzyki w tym stylu a DJ Spooky gra go całkiem sporo. słyszałem o jakiejś kłótni obu panów o to kto jest twórcą illbientu. po mojemu twórcą jest ten kto gra tą muzyke i ten kto wymyślił całą ideologie tego nurtu czyli jednak DJ Spooky a nie DJ Olive który może i wymyślił nazwe ale tylko tyle uczynił dla tego gatunku. panie Spooky może by sie pan wypowiedział na ten temat?